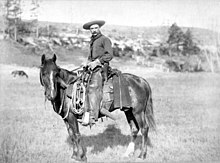 'S e balach-cruidh neo gille-cruidh (Beurla: cowboy) a thèid air muin eich timcheall air tuathanas mòr ann an Astràilia, Canada agus gu h-àraid ann an Aimearagaidh a’ coimhead an dèidh cruidh. Tha cultar mòr ceangailte leis a’ ghille-cruidh, m.e. rodeo, tuath-cheòl (country and western) agus an Siar-sgeul (Western) sa litreachas agus film. Air a tharraing à "https://gd.wikipedia.org/w/index.php?title=Gille-cruidh&oldid=524133"
Chaidh an duilleag seo a dheasachadh 29 dhen t-Samhain 2016 aig 08:08 turas mu dheireadh.